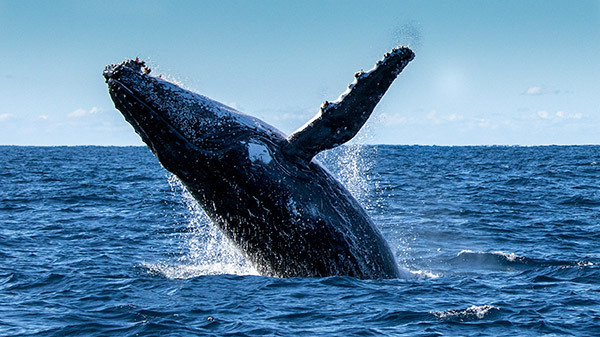 Dana Point Sportfishing provides the ultimate whale watching trips, giving you an up close and personal experience with the wildlife we have just outside Dana Point Harbor. Southern California has some of the richest sea life in the world. There is no better way to experience it than on a private boat with just your family and friends. We offer trips for up to 6 passengers on our Parker Boat (LOA 30′). Our private boats provide a unique atmosphere where you’ll have the chance to see Whales, Dolphins, Sharks, Marlin, Seals, Sun Fish and variety of other sea life. In 2017 Dana Wharf has already recorded seeing 585 Grey Whales, 35 Humpback Whales, 9 Fin Whales and 3 Minke Whales. Dana Point Harbor is a key migration point for a variety of whales and other sea life. We get wild life migrating down to Mexico and up to Northing California, Oregon and Canada. The Coast line off Dana Point is located on a steep underwater shelf that extends over a 1,000 feet deep just a couple miles off shore. Giant sea life will travel out of the deep water and feed off our nutrient rich kelp forest located just a quarter mile offshore. This makes for quick boat rides with the shot at seeing some of the most amazing sea life the word has to offer. 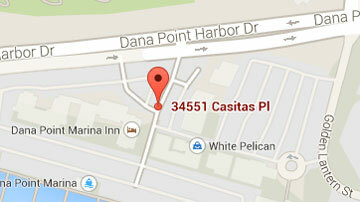 Our boats travel at over 30 knots so we’ll be right in the action just minutes after departing Dana Point Harbor. The Blue Whale or its scientific name, (Balaenoptera musculus), is the largest animal on earth. The Blue whale can grow up to 100 feet in length and weigh nearly 200 tons. Underwater the Blue Whale oaks true blue but as it surfaces it looks like a blue/grey color. Their underbellies have a yellow hue which is caused by the millions of microorganisms that take up residence in their skin. Their diet is composed of consuming krill which are tiny shrimp like animals. 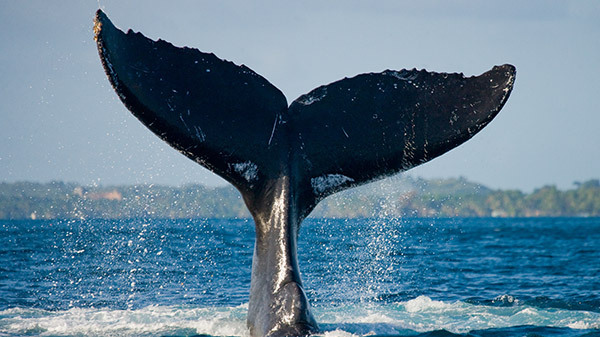 The whale can consume almost 4 tons of krill a day. The Blue whales have fringed plates, called baleen, attached to their upper jaws. When the whale gulps a massive mouth full of water and krill the whales massive tongue forces the water out through the baleen plates only leaving the krill behind. Blue whales live all over the world and can swim in small groups but usually are seen in a pair or even y themselves. They swim about 5 miles per hour but can accelerate if needed close to 20 miles per hour. Being the largest animal on the planet they are also one of the loudest. They create pulses and moans to communicate with each other and it is said they can hear each other from up to a 1000 miles away. The Blue Whale Calves are carried in the mothers belly for nearly a year. At birth they come out at nearly 25 feet long and weighing up to 3 tons. It consumes its mother’s milk every day for the first year gaining almost 200 pounds a day. With an estimated average lifespan at around 80 to 90 years old scientists have discovered that the oldest Blue Whale found is around 110 years old. The Gray whale, Eschrichtius robustus, is almost always covered with parasites all over their back and snouts making it look like white ocean rock. The Gray Whale can grow up to 50 feet in length and weigh up to 40 tons. The whale searches the ocean floor for tiny creatures using its snout to forage and silos get the creatures. It then filters the creatures with its plate of strainers in its upper jaw. The Gray whale is one of the animal kingdoms great migratory, traveling in its pods for almost 13000 mile long trips. Traveling from Alaska all the way to the Mexican Coast where they mate and give birth. Nearly 20,000 whales migrate past Dana Point. Fin whales, Balaenoptera physalus, are the second largest baleen whale measuring up to 80 feet in length. They have two colorings on their jaw with gray or black on one side and white on the other. They fin whale is very fast and eats small fish. They circle the schools of fish using the white side of their face scaring the fish into smaller schools making it easier for the whale to catch its prey. Minke Whales, Balaenoptera acutorostrata, are the smallest baleen whale that we see in our ocean. 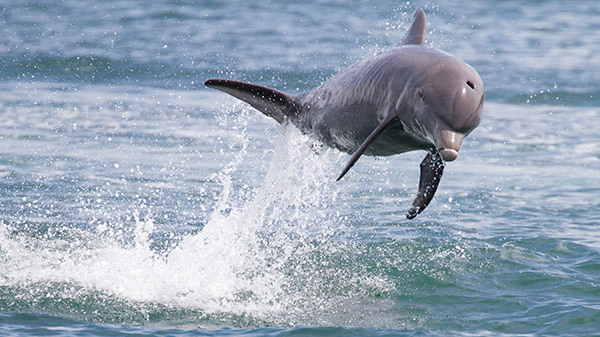 Growing up to 30 feet in length they are sometimes mistaken as a dolphin. They have a black color to them with a curved dorsal fin. Humpback Whales, Megaptera novaeangliae, are known for its magical songs and noises it makes which travel long distances in the water to each other. These howls and cries can continue for hours communicating with each other and attracting potential mates. The Humpback grows up to about 63 feet in length and weighing up to 40 tons. They feed off of krill, plankton, and small fish. Humpbacks migrate annually from summer feeding grounds near the poles to winter breeding grounds near the equator. When a mother gives birth to her calve they are seen swimming side by side almost always touching. The females will nurse their calves for almost a year though it takes longer for the humpback to reach full adulthood, growing until they are ten years old. Humpbacks are also known for being a powerful swimmer and breaching completely out of the water. Orca (Killer Whale), Orcinus orca, is most commonly known as “Shamu” or the show whales seen at SeaWorld. These are one of the most amazing whales to see in the wild rather than in captivity. They can grow up to 32 feet long and weigh up to 6 tons. 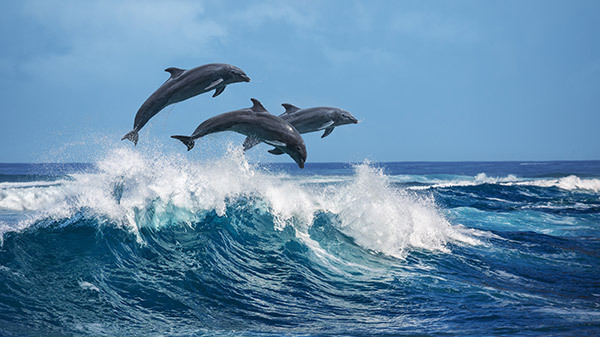 Living up to 60 years of age, these are the largest of the dolphins and one of the world’s most powerful predators. Their diet consists of hunting and consuming marine mammals such as seals, sea lions and even small whales. Though these are usually found in colder water such as the arctic we do see them off our coast from time to time. Hunting in pods of up to 40 orcas they are very good at working together to hunt their prey. The Sperm Whale, Physeter macrocephalus, can grow up to 59 feet in length and weigh up to 45 tons. “Sperm whales’ heads are filled with a mysterious substance called spermaceti. Scientists have yet to understand its function, but believe it may help the animal regulate its buoyancy.” (National Geographic) The Sperm Whale is known for the long and deep dives in search of squid which is its primary food source. The Sperm Whale can dive down almost 3200 feet deep and hold there breathe for up to 90 minutes before resurfacing. They usually travel in pods with 15 to 20 other Sperm Whales. They migrate close to the equator to give birth and with a huge fluke (tail) stretching 16 feet from tip to tip they can travel 23 miles per hour. Pilot Whales are members of the dolphin family and there scientific name is, Globicephala macrorhynchus. They can grow up to 20 feet in length and weigh up to 2200 pounds. Their diet consists of consuming squid and other small fish. They can dive down thousands of feet in search of squid. Growing up to 6 feet in length and travel in pods from 200-1000 dolphin at a time. Growing up to 12 feet in length and are known for their playful behavior. The average size of a Risso’s dolphin is 10-12 feet in length and have a round head. Average size is 7 to 8 feet and are black and white. They are very playful and friendly. 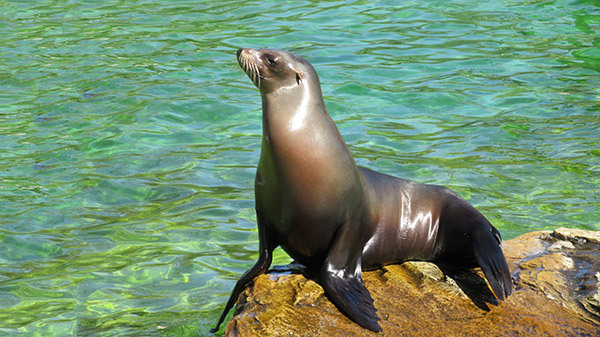 The sea lion can grow up to 7 feet in length and weigh up to 860 pounds. They can usually live up to 30 year and consume a vast amount of fish species. The harbor seal, spending most of their time in or near our coasts harbors can grow up to 6 feet in length and weigh up to 300 pounds. They can live up to 35 years with females outliving males by 10 years. Their diet consists mostly with fish species. While most of the Elephant Seal population can be found further north like Santa Barbara and San Francisco where the water is colder, every now and then we get lucky enough to see one. They grow up to 20 feet in length and weigh up to 4.5 tons. 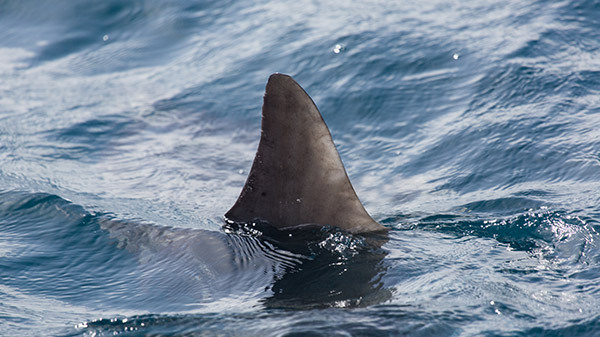 The Great White Shark can grow up to 20 feet in length and weigh up to 5000 pounds or more. They come to breed off our shores and they are one of the deadliest predators we have on our coast. The blue shark can grow up to 10 feet in length and spends most of its time offshore feeing on pelagic fish and diving deep for squid. The Shortfin Mako can grow up to 15 feet in length is the fastest shark and one of the fastest marine animal traveling up to 60 mph. The Shortfin Mako can travel over 60 miles per day. The Basking Shark can grow up to 40 feet in length and can weigh up to 21 tons. They have been recorded to dive up to 6500 feet deep. They have tiny hooked teeth and gill rakers that can filter tiny plankton which is its main diet. Usual seen off our coast during the summer when the water is warmer. Growing up to 20 feet in length and weighing up to 1000lbs. The average lifespan is from 20 to 30 years. The White Pelican grows to about 62 inches and is white all over its body with black tipped feathers on its wings. It has a yellow/orange beak dipping it in the water to catch fish. 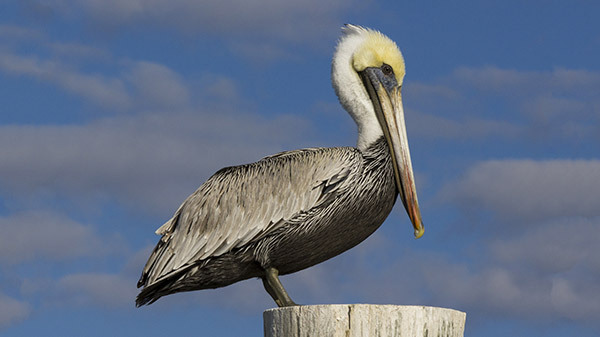 The Pelican can plunge almost 65 feet into the water for its prey. It grows to about 51 inches is dark brown with a long orange beak. Amazing swimmers, the Cormorant can swim and dive almost 400 feet deep to find food. It grows to about 31 inches and is all black in color. Growing up to 19 inches these seagulls are a darker grey with a red beak. Their diet consists of fish, marine invertebrates, insects, and trash. 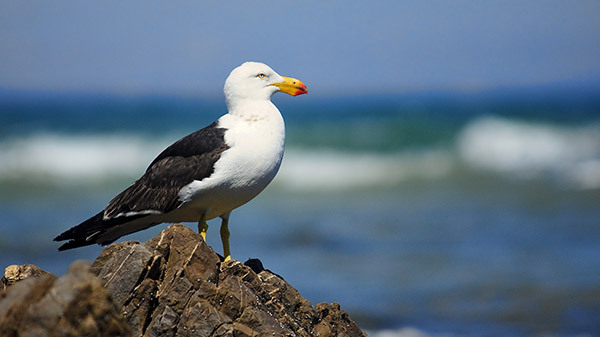 The California Gull, which is the most common we see on our trips, grows up to 21 inches. It has yellow legs and a yellow beak with black and red spot on the lower mandible. It is white and light grey. Their diet consists of fish, marine invertebrates, insects, and trash. Growing to about 21 inches, the Caspian Tern has a dark red beak and black legs. It is the largest tern in the world. Grows to about 15-16 inches and has a black cap that covers its eyes and a light yellow to reddish orange beak. Their main diet is schooling fish such as anchovy and sardine. Experience shared by local business owner and frequent flyer Max Koby, of San Clemente’s SC Pool and Spa works. I book The Alexandria at least once a month for either fishing or scuba diving. My wife had been wanting to get out on the ocean with me and has always wanted to see a whale in it’s natural environment, so I hired Captain Cheyne to take us out for some whale watching. He put us right on the mark and my wife shot this picture with my GoPro. It was such an amazing experience to be able to share with my wife aboard a private boat. Thanks again Captain! I was looking for a boat to rent in Dana Point Harbor for my Sons birthday. I was walking along the boardwalk and we spotted Captain Cheyne and The Alexandria. We decided to give him a try, and we definitely made the right decision! It was Awesome! My boy and his friend now have a memory of a lifetime and literally haven’t stopped talking about it ever since! The Captain put us right where we needed to be and I snapped this amazing picture with my I Phone. After the trip was over my boy told the Captain, “that was the best birthday ever Captain Cheyne, thanks for being our Captain!” “The picture of the boys throwing their hands in the air when we saw the whale says a thousand words. Thanks again, can’t wait to try some fishing with you!